PFLAG (Parents, Families and Friends of Lesbians and Gays) is a national, not-for-profit organization that began in 1973. Its primary mission is to Support and Educate families, friends and loved ones of those who identify as Lesbian, Gay, Bisexual or Transgender. PFLAG also Advocates on their behalf. 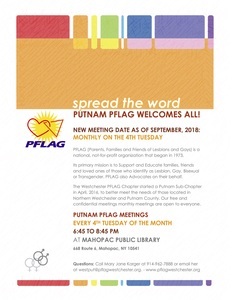 The Westchester PFLAG Chapter started a Putnam Sub-Chapter in April, 2016, to better meet the needs of those located in Northern Westchester and Putnam County. Our free and confidential meetings monthly meetings are open to everyone.